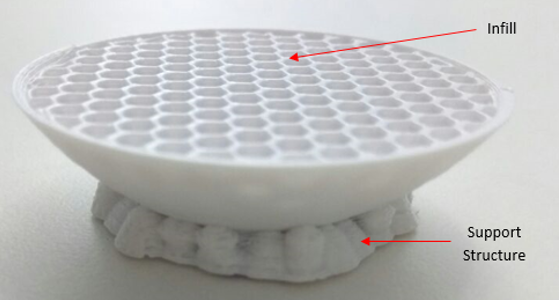 One of the most common questions that we encounter is: How to make models hollow in 3D Printing?! So we decided that it was about time we published an article addressing this concern. Models are shelled or made hollow to either reduce the cost of the part, or to reduce weight. But more often than not, in 3D Printing, it’s the former which garners far more prominence than the latter, since major cost in 3D printing depends on the amount of material consumed. Models can be hollowed in laser sintering (SLS) and filament deposition (FFF) technologies. But the technique and procedure is different in both the processes. Let’s have a look at how one can shell or hollow the models in these technologies. SLS is a powder based 3d Printing technology, wherein a laser scans and sinters the part layer by layer based on the input 3D CAD file. 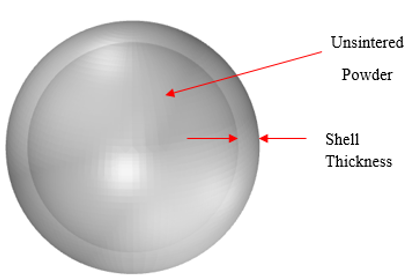 For instance, consider the sphere (model) shown in Fig. a. The model is completely solid, which will result in increased weight and material consumption. This model can be made hollow by giving it a shell thickness of say 1–2mm. After giving it a shell thickness as shown in Fig. b, the laser will now scan and sinter only the shelled part, whereas the rest of the part will remain unsintered. 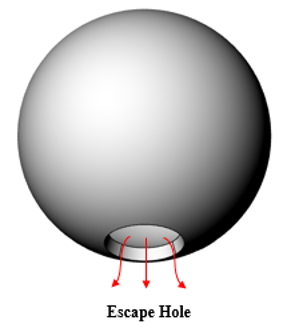 If you observe closely, since the sphere is a closed geometry, despite making the model hollow, the unsintered powder will remain trapped inside the model. Thus, despite shelling the part, the part is now as good as being fully solid. Shelling the part geometry hasn’t made a difference to the weight of the part or to cost, for that matter. To overcome this problem, an aperture, as shown in Fig. c, needs to be provided to remove the unsintered powder. Such an aperture to remove the excess, trapped powder is termed as an Escape hole. 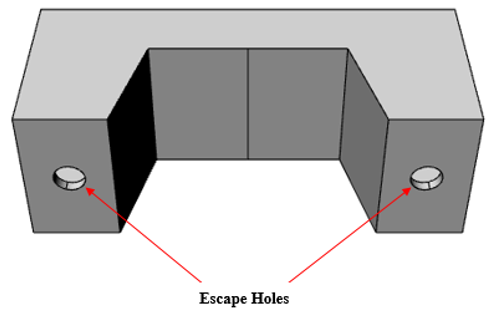 The minimum diameter of an escape hole and the number of holes required, depends highly on the part geometry under consideration. We recommend an escape hole diameter of at least 6mm. For any powder based technology, in case the models are to be made hollow, an escape hole is a must! For the part geometry shown in Fig. d, multiple escape holes are required to facilitate smooth removal of the unsintered powder. For geometries requiring multiple escape holes, we recommend the hole diameter of at least 5mm. This procedure holds true for other powder-based technologies — Color Jet Printing — and resin based technologies as well. To conclude, for any powder based technology, in case the models are to be made hollow, an escape hole is a must! Since FFF is a filament based technology, the concept of escape hole doesn’t hold true here. The methodology to make models hollow in FFF is very different from that seen in SLS. While printing the part in FFF, there’s a parameter called as “infill percentage” which corresponds to the solidity of the part. This parameter controls the material deposition. A 100% infill would correspond to a fully solid part. As the infill percentage is reduced, the density of the part will be reduced, thus making the part hollow-esque. Fig. 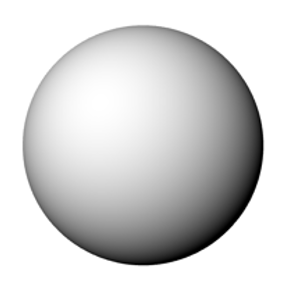 e, shows the sectional view of the sphere with 30% infill. 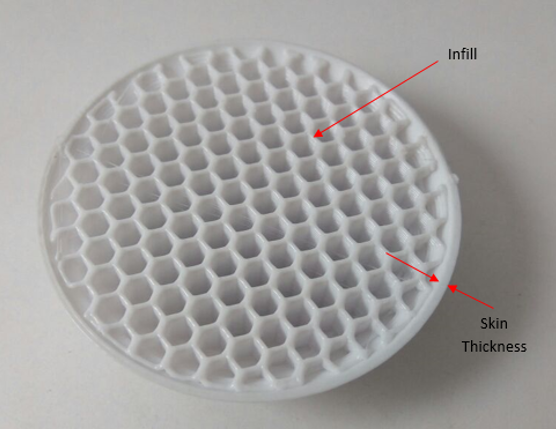 There are different infill patterns available in a 3D Printer’s library. The most common ones are hexagonal and octagonal. A 0% infill would correspond to a fully hollow model. But for a minimum decent strength, we recommend an infill of at least 30%. A 50% infill usually serves the purpose for models requiring better strength and rigidity. There’s a parameter called skin thickness which is the equivalent of shell thickness in SLS technology. This skin thickness parameter will determine the outer wall thickness of your model, whilst the rest of the inner geometry will be filled with infill structure (Refer Fig. e). Kindly note that infill and Support Structures are two different things. Infill corresponds to the structure that gets formed on the inner side of the part geometry. Whereas support structures are formed on the outer side and they are used to support the overhanging or protruding features of a part geometry. Fig. f, shows the distinction between infill and support structures. We hope you found this article helpful. Do let us know your feedback on the same. Also, kindly intimate us on any other 3D Printing related topic you want us to address.